The Mary E. Pitney House Museum was built in 1874 and was always the home of Marcellus and Anna (Hollis) Pitney and their family. 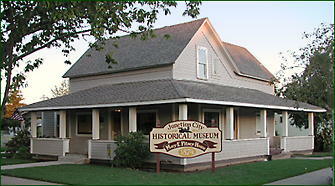 Mary Pitney who was born in the house, gifted the house to Junction City Historical Society to be used as a museum. She died in 1995 at age 104. Many hours of restoration made the house ready to be opened to the public in 1998. The front parlor is furnished with Mary’s original furniture in the Eastlake style. One room has been set up as “A Danish Room in an American House”. A cutaway section in the kitchen lets visitors see how buildings were constructed in that time period. Most of the plantings, including the grape vines on a new arbor have been on the homesite for years. In 1998 Junction City's first jail was identified in another part of town and was moved to the Pitney property near the house. 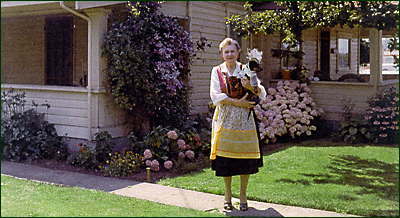 It, too, has had hours of restoration and is open to the public when the museum is open..
Mary in her yard, mid-1960's. Dressed for Festival. 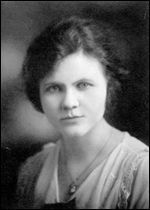 Mary Pitney (1891-1995) was the granddaughter of pioneers John and Elizabeth Pitney, who came by covered wagon over the Oregon trail and settled on a donation land claim just west of Junction City in 1853. The original land claim on Pitney Lane is still owned by family descendants. Mary's house was originally built as a town house for railroad workers. She was born and raised in the house and lived the later years of her life here. She was a school teacher, published poet, world traveler, and a humanitarian. She cherished her pioneer heritage, her town, the Scandinavian Festival, her church, and garden, and her many friends of all ages. She loved to sing and paint and used her many creative talents to furnish her home much like a museum and gallery. Upon her death at age 104, she bequeathed her home to the Junction City Historical Society. She was one of the founding members of the Junction City Museum, and requested that her house be used to display artifacts overflowing from the Museum.